On my way to California, over the July 4th weekend, I got to read a book the name of which I had heard a few times too many. Authored by the Chennai born, now Mumbai resident Aravind Adiga, The White Tiger is a story of a village boy by the name of Balram Halwai. The story, written as a letter to a Chinese diplomat scheduled to visit India in the near future, starts off with Balram walking the diplomat through a series of events in his life leading to his present day life . The author, over the course of the story, tries to shed some light behind the way the poor in India are treated by the rich and through the eyes of Balram, tries to put the reader in the shoes of Balram Halwai. Arvind Adiga has a weird style of writing. This intelligent kid, nicknamed The White Tiger narrates the story in such a manner as to portray himself as a naive village idiot. Strangely, this intelligent but naive village idiot (yes, i recognize the contradiction) resorts to a very formal way of narration in the latter part of the book and concludes the story with a certain air of authority that is almost impossible to associate with a village idiot. Now, it could be that the character matured as the story progressed but thats a supposition the reader would have to make based on the style of writing for there’s certainly nothing in the story that will tell you that the character is maturing as a result of, let’s say, his experiences or age. While I’m not a prolific reader of books authored by Indians (and no, I’m not biased), I feel Jhumpa Lahiri, the Indian American author, stands a notch or two above Aravind Adiga. All said, the book is a light read. So, if you have nothing better to do, this book might just help you kill some boredom. “Dress your family in Corduroy and Denim” – My first book of the famed American humorist, David Sedaris. The book is a collection of 22 essays reflecting his life. I can’t recall a book I’ve read that combines sadness with humor and after this, I’m left with a unique feeling that I’ve never before been left with. A worthy book that makes good reading. Dan Brown has had me swinging both ways but now I’m gonna hold my fort. I first read his “Angels and Demons” and I was mildly impressed with it. Since then, its been downhill all the way. I finally hit the rock bottom yesterday as I finished reading his “Da Vinci Code”. By far his most popular book, I found the book extremely disappointing. It could because I watched the amazingly sad movie before I read the damned book or because I’ve been following this whole James Cameroon’s ‘documentary’ of the “Tomb of Talpiot” but I highly doubt its either. The book is flavorless. I can squeeze a few grace marks for content but thats about it. Makes me wonder how the book sold the millions that it did. There are few books that have disappointed me as much as this has. Coz of all the media hype, did I go into reading this book expecting too much? Or does it have anything to do with faith and religion? Naah! Too much thought into this is a waste of time. Anyway, in all his books, theres this female character who is all beauty and brains. There was Vittoria Vetra in Angels and Demons, Rachel Sexton in Deception Point and Susan Fletcher in Digital Fortress. This time its Sophie Neuve. He’s authored 4 books and has already managed to establish a stereotype. Gotta hand it to him on that one! Of the 4 books he has authored, in my opinion, Angels and Demons walks away with the honors. The rest of ’em….well, they fail my class! Class Dismissed!! It’d been a REALLY long time since I read a Grisham. Picked up this book recently and just couldnt drop it! The ending is a bit of an anti-climax but the for the best part the book is wonderfully written. In the foreword, Grisham claims that the main character of the book, Jake Brigance, is a lot like him. They’re of the same age. Both represent people (As against corporations), both played quarterback when in school, both drive Saabs n so on. Strangely, while the plot revolves around this street lawyer, I didnt get the impression that he was one of those brilliant lawyers. Infact, I found his defense rather weak. While his style of writing is quasi-perfect, his story could’ve been bettered. The character of Ellen Roark was a welcome ‘surprise’. Her entry into the plot is as unexpected as her disappearance. Towards the end, her disappearance was a sort of a let down. I thought she deserved a more influential role in the plot. All said, its a very worthy read for Grisham is truly an master storyteller! 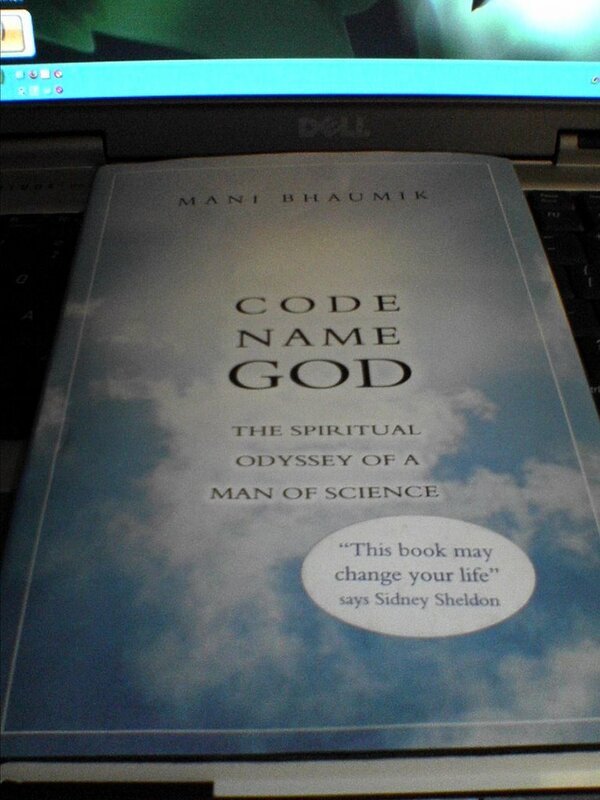 A self made multi millionaire,Mani Bhaumik, co-inventor of the excimer laser, offers a unique blend of science and spirituality in this book titled ‘Code Name God’. A book unlike any other book I’ve read thus far. Mani offers a very unique perspective on the creation of the universe. Its been about 2 weeks since I first picked up this book and over the same period this book has left me with plenty to ponder about. My middle name being ignoramus I found a lot of what Mani has to say surprising. Who knew Yoga is also performed to prepare the mind for meditation? Or that at planck’s dimensions, the 4 natural forces that we know of today behave identically?…..sorta leading towards the Grand Unified Theory which so far has stood on the pillars of mathematical equations and almost no physical proof? or that zero could be connected to infinity! “……in other words, once we include negative numbers, could zero as easily stand for the source of everything as the realm of nothing”! Perspectives such as this coming from a scientist makes you think about what he has to say. The book sometimes gets heavy and the going gets slow (which explains my 2 weeks). For people looking to connect the dots of science with spirituality, this book might be worth the buy.